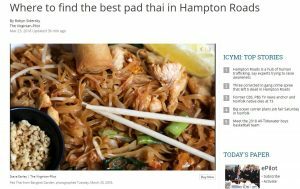 Alice was part of a Pad Thai Taste Test with the Virginian Pilot last week. Maybe there is some accounting for taste after all! Spoiler: the best Pad Thai in town can be found at Bangkok Garden in Loehmann’s Plaza.